Original artwork by George D. Bluebird, Sr. I believe that the importance of belonging to a larger group, community, or family cannot be understated in relation to today’s societies. On a large scale, we’ve wandered away from the village mentality into a highly individualized existence resulting in disproportionate demands on the person rather than persons. Pockets of true community are now sparse but tend to be the driving force for social, economic, and political change. On a smaller scale, in a school for example, a sense of community may be what makes true social and academic learning possible. In Native American and First Nations cultures, significance was nurtured in communities of belonging. 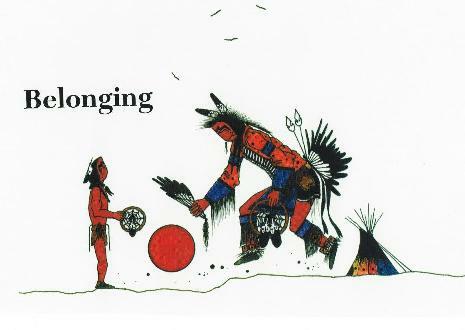 Lakota anthropologist Ella Deloria described the core value of belonging in these simple words: "Be related, somehow, to everyone you know." Treating others as kin forges powerful social bonds that draw all into relationships of respect. I want you to think of those around you. Think of someone who may 'feel' different, or perhaps that they don’t belong to the group. What would that actually feel like? Maybe you feel like one of these people. You are certainly not alone. As we strive to create inclusive environments in our schools, we must work together to create a culture where all are accepted regardless of ability, religion, sexual orientation, cultural background, skin color, hobbies, interests, strengths, weaknesses, and family history. We must work together to be a truly inclusive community of learners. I personally believe that a sense of belonging is the foundation on which we build all other skills. In essence we may actually be discussing the underpinning of community and belonging which is empathy. Our ability to recognize feelings experienced by another being is the skill needed when forming connection, community and belonging, ultimately bonding us to the larger human experience.